In December 2013, Candice Thomas felt anything but hopeful. She had moved to Georgia for a job, but the position was eliminated before her first day. She relied on limited support from family, but then college student loans kicked in, and she soon found herself staying at a homeless shelter with her four-year-old daughter, Cadence. 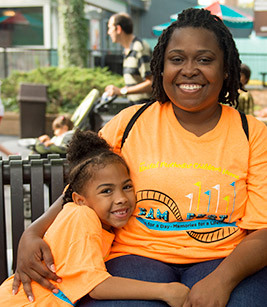 Candice and Cadence Thomas enjoyed a day of fun together at the first annual Children’s Home Fam-Fest in September. The event was a chance for those we serve to enjoy a day of family fun. The Children’s Home Family Housing Program protects and preserves families at risk of homelessness. The program provides a safe place to stay, as well as support including case-management services, budget and employment counseling. When families leave the program, they are both financially and emotionally stable and move into their own home. With support from the Home, Candice has found a full-time job as a social worker. She is working to improve her credit, manage her time and take care of herself. She has cut out negative friends and set boundaries for some of her family members. Candice exudes confidence and positive energy, and one can tell just by talking to her that she will achieve her goals. She is a risk taker – having grown up in extreme poverty in Florida, the youngest of 16 children – she had nothing to lose. She also is determined. She hopes to begin work soon toward her master’s degree so she can be a licensed clinical social worker in a private practice. And her daughter has started tumbling, so that she can be a cheerleader in a few years. Candice recently achieved one very important personal goal – she and Cadence finally found their first real home in time for Christmas – they moved out of The Children’s Home in early December. 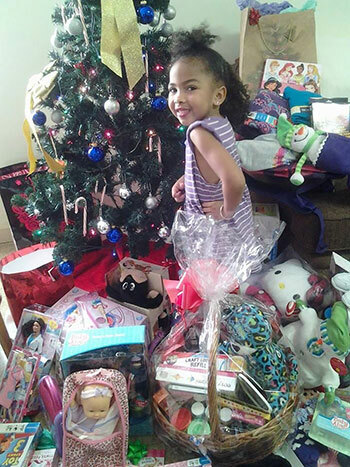 Cadence Thomas poses next to her first-ever Christmas tree at The Children’s Home in December 2013. “It was my daughter’s first real Christmas,” said her mother, Candice. Our Family Preservation Services – family counseling education, parenting classes, financial aid and the residential Family Housing Program – help families stay together and become stronger. In 2014, The Children’s Home has served 20 families through the Family Housing Program. Each family stays in one of the Home’s 13 townhomes for an average of 18 months before moving on to a higher level of independence. More than 450 families have received emergency financial aid to avoid utility cut off or eviction this year, and more than 65 families have taken part in counseling or parenting education.